This trek is the counterpart to the traditional Inca Trail to Machu Picchu – it is more remote, challenging and rugged but also less crowded and therefore more authentic than the Inca Trail! You will travel with a small group, hike the ancient and remote footpaths, climb high on the sacred Salcantay, the highest mountain in the region and then descend through cloud forest to near jungle. The trek will lead you through barren mountains and lush growth, over brooks and rivers, and hot springs will be found on the way. You will get to feel the temperature difference in the various heights, maybe even experience snow, the highest point being 4650m. /15200ft. above sea level. The trek is ending in the sanctuary of Machu Picchu where you will join a guided tour and also have time to explore this unique and sacred place by yourself. We will pick you up from your hotel at around 4:30 and take the bus to Mollepata. While you are having breakfast (optional) the cook and horsemen will pack all the camping and cooking equipment. Ready for trek, we start hiking uphill to get to Cruzpata (approx. 3 hours). Enjoying panoramic views of the beautiful snow-capped mountains Humantay (4120m/13500ft) and Salkantay (6271m/20575ft) we will have lunch. This is only the beginning of the picturesque views awaiting us! We continue our hike towards Soraypampa, our first campsite (3800 m/11750ft; the highest and coldest campsite of the trip), very close to the snow-capped Salkantay. After an early breakfast we start walking at about 5:30am. This day will be the day with the longest hike. The first 4 hours we are walking uphill to get to the highest point of the trail (4650m/15200ft), located halfway between the huge mountains Salkantay and Tucarhuay. After a rest on the pass we continue our walk downhill through a dramatic cloud forest towards Huayracpunku. After lunch we’ll walk towards the tree line of the jungle and reach our second campsite, Chaullay or Colcapampa (3000m/9800ft). After breakfast we start walking through the upper jungle, crossing the Lluskamayo River and a variety of little brooks, reaching La Playa after about 6 hours. We will pass through valleys and enjoy wonderful views of waterfalls, tropical fruits and plants. Arriving at La Playa, the horses will return to Mollepata and we continue walking to Santa Teresa (1500m/4905ft), where we will camp in a nice and warm climate. After a short rest, we visit the hot springs of Santa Teresa and enjoy the well-deserved pleasure of soothing water! We pick you up from your hotel around 7:30 a.m. and travel by bus to Abra Malaga Pass where we are going to start our biking tour to Santa Maria. On the rapid downhill ride we’ll enjoy the beautiful sceneries of the mountains and the cloud forest, typical for this region. Our biking will last about five hours until reaching Santa Maria. If you still have energy and are looking for more action, an exciting River Rafting adventure is waiting for you (optional). We spend the night in a basic hostel in Santa Maria. Morning begins very early, around 4.00am. The plan is to experience a beautiful sunrise at the Sanctuary of Machu Picchu. To get there, you can either walk for about 1.5 hours or take the first bus that leaves at 5:30 and takes about 25 minutes. Arriving we will see the magnificent citadel quietly being filled with the light of the day. After a short rest, a walking tour is given by your guide, showing you the most important sights of the archaeological complex. After the tour you will have time to explore the mysterious city by yourself. Optional you climb the peak of Huayna Picchu or Machu Picchu Mountain (prior booking!). Later in the afternoon you take the train from Aguas Calientes to Ollantaytambo and return to Cusco by bus where we’ll arrive at night. 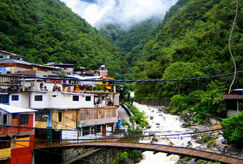 1 night accommodation in a hostel in Aguas Calientes. Meals: 4 breakfasts, 4 lunches, 4 dinners (Vegetarian / special diet options available). Collection from your hotel (we pick you up from where you are staying). Bus Cusco – Mollepata (trailhead). Train Aguas Calientes – Ollantaytambo. Professional, English speaking tour guide for the whole tour. Assistant Guide (for groups of 10 or more people). Cook, Horseman, mules or porters (they just carry cooking stuff and camping equipment). Camping equipment (tents, cooking and eating tent, chairs and tables). Sleeping mattresses (if you want comfortable air mattress, it also can be hired from us). Bus Machu Picchu – Aguas Calientes. Round trip: US$ 25.00 p.p. Extra horse to carry any extra backpack.